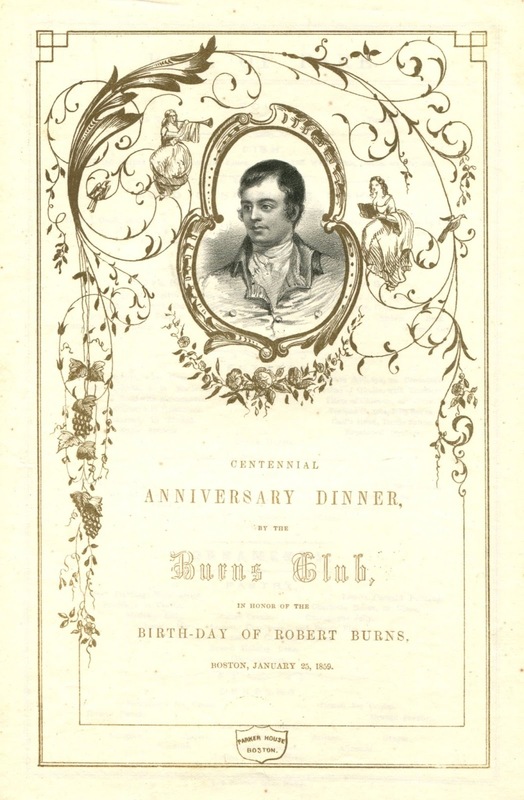 A more lavish banquet was held at the Parker House in 1859 to mark the poet's centennial. 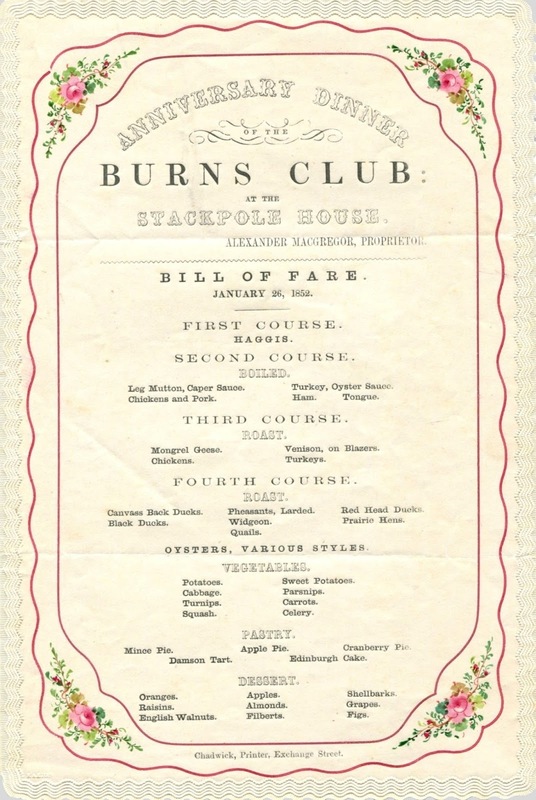 This event was attended by 250 distinguished citizens like Ralph Waldo Emerson and Oliver Wendell Holmes. 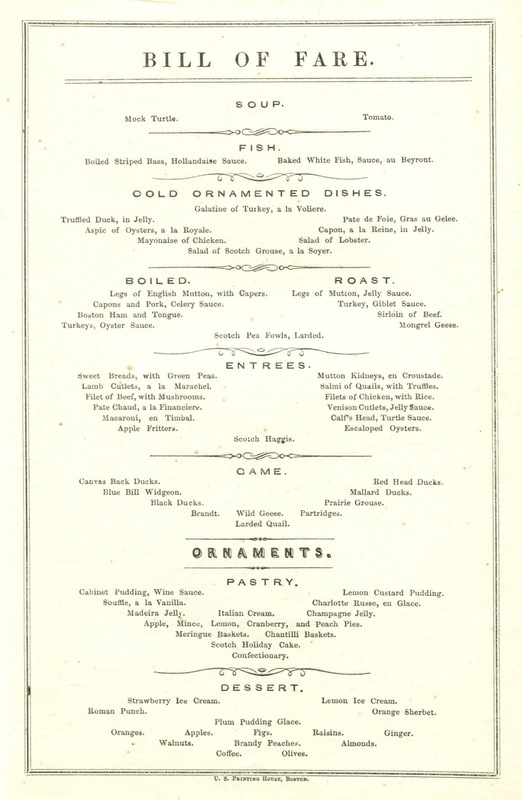 While the dinner featured a wide selection of fancy entrées and game dishes, the ordinary orange, scarcely noticeable at the bottom of the page, was the most newsworthy food of the evening. By the mid-nineteenth century, it was not unusual to find oranges listed among the fruits and nuts, for the orange had become the most commonly cultivated tree fruit in the world, even though shipping them to distant markets remained a formidable challenge. It was in this context that they were in the news in January 1859, when “much of America followed eagerly as a ship laden with three hundred thousand oranges raced full sail from Puerto Rico to New England to show that it could be done,” according to Bill Bryson in At Home: A Short History of Private Life. 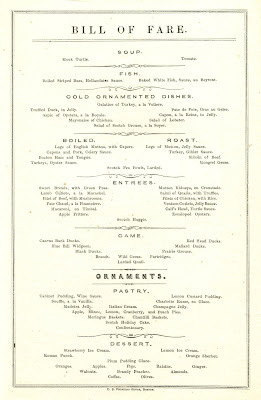 “By the time it arrived, however, more than two-thirds of the cargo had rotted to a fragrant mush.” Despite the loss, plenty of oranges arrived in good enough condition to round out this menu, if only to appear at journey’s end as something of an afterthought. So interesting! And how much more elaborate the Parker House menu is, with orange sherbet too. Shared with a Scottish colleague and he thought this dinner a much too fancy a feast for a Burns' supper! 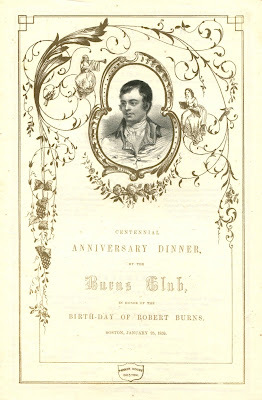 He hosted one a few years ago and Haggis was the feature dish.